The dumpling (jiǎo zǐ 饺子) is one of the main dishes on the Chinese New Year menu. Its history dates back to 200 B.C. with its ancestor Han Dynasty’s “Wonton”. Wonton acquires its shape for commemorating the creator of the world in the famous fable, Pan Gu. In the fable, Pan Gu ends the chaotic states by separating the world into two half-egg shaped parts: sky and earth. 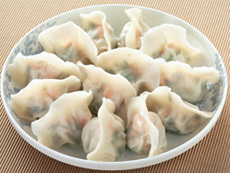 The earliest record of dumpling in ancient literature was during 500 A.D., which says Wonton "shaped like half moon and food was passed around the world.” At that time, due to undeveloped cooking methods and lack of cooking equipment, the dumpling, with wrap and stuffing, was considered an extremely delicate food. Its delicacy made it an exclusive dish to savor. People ate them with soup and the style is still popular in some areas, however, different places have different soup bases. Eating dumplings soup started in the Tang Dynasty. In 1972, Chinese archaeologists discovered dumplings in a Tang grave near Tulufan, Xinjiang. Its shape was similar to the modern dumpling. It gradually became the ideal Spring Festival food in the northern part of China during the Ming and Qing Dynasties. 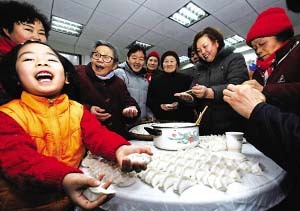 During the Spring Festival, every house have tables filled with white and shiny dumplings. Dumplings are always made before midnight and eaten during the last hour of the old year and the first hour of the Lunar New Year. 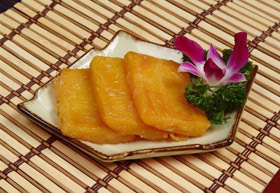 Nian gao (nián gāo 年糕) is a versatile ingredient, the main ingredients of Nian Gao are sticky rice, sugar, Chestnuts, Chinese date and lotus leaves. It also has a very wide range of eating which can be cooked by frying, steaming, stir-frying or boiling. Nian gao has the symbolism of raising oneself taller in each coming year, In Chinese people's mind, the higher you are, the more prosperous your business is. So Niangao become more and more popular among the whole Chinese during the Spring Festival. Tang Yuan (tāng yuán 汤圆) is a Chinese food made from glutinous rice flour. 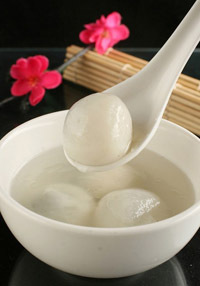 Glutinous rice flour is mixed with a small amount of water to form balls and is then cooked and served in boiling water. Tangyuan can be either small or large, and filled or unfilled. They are traditionally eaten during Yuanxiao, or the Lantern Festival. 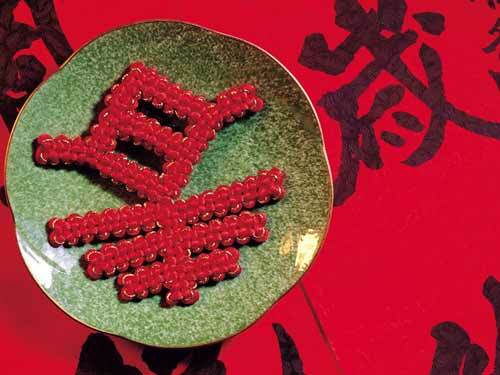 There is a legend of the original of Tang Yuan, in the Han Dynasty, there was a maid of honor who was called Yuanxiao. She missed her parents a lot but she could not leave the palace, therefore, she wept all the time and even wanted to turn to suicide. A minister knew her story and promised to help her. What Yuanxiao needed to do was to make lots of Tangyuans, which was the best cuisine she could make, in order to worship the god on 15th day of the first month in the Chinese calendar. Finally, Yuanxiao did a great job and the emperor was so contented; therefore, Yuanxiao was permitted to meet her parents, Tangyuan was named as Yuanxiao and the 15th day of the first month in the Chinese calendar was considered to be Yuanxiao Festival.According to the record of history, Tangyuan has been a popular snack in China since Sung Dynasty. For many Chinese families in mainland China as well as overseas, tangyuan is usually eaten together with family. The round shape of the balls and the bowls where they are served, come to symbolise the family togetherness. So It has been a indispensability recipe for Chinese people on Festival of Lanterns. Spring Rolls (chūn juàn 春卷) also named Spring Cakes by some northern Chinese, have a long history in China. It's said that as early as in the Eastern Jin Dynasty (316-420), people would eat 'Spring Plate', a dish with thin flour-made cakes at the center of the plate and green vegetables around them, on the First Day of Spring every year. 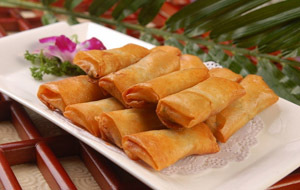 Along with the development of the cooking techniques, 'Spring Cakes' have been evolved into the present lovely golden spring rolls made of thin flour wrappers with various fillings – sweet or savory, meat or vegetables. The fried spring rolls are all with golden color, which makes them looking like gold bars, the symbolism of treasure. Bacon (là ròu 腊肉) is a cured meat prepared from a pig. It is first cured using large quantities of salt, either in a brine or in a dry packing; the result is fresh bacon (also known as green bacon). Fresh bacon may then be further dried for weeks or months in cold air, boiled, or smoked. Fresh and dried bacon is typically cooked before eating. 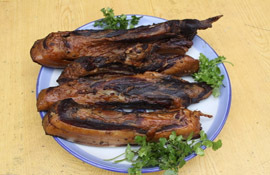 Boiled bacon is ready to eat, as is some smoked bacon, but may be cooked further before eating. Bacon is an essential recipe for people from south of china, but in north, it is less common. 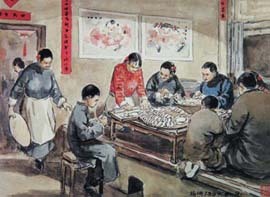 Fish (yú 鱼), usually of a local variety, is an important item on the dinning table of thousands of families on the eve of the Spring Festival. 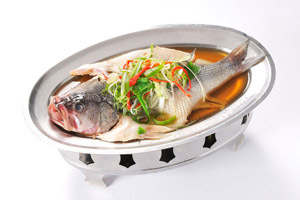 Fish is pronounced 'yu' in Chinese, with the implications of having more than just a basic need each year. It is also a present exchanged between relatives and friends during the Chinese New Year. 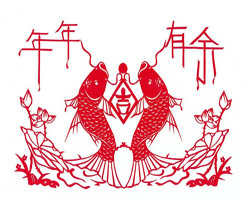 In southern China, some people just eat the middle part of the fish on the New Year Eve, leaving the head and tail to the next day to symbolize completeness. Meanwhile, it is particularly important that when fish is placed on the dining table, its head must be at the elders, as a sign of respect. Fish sounds like "save more". Chinese People always like save more money at the end of year because they think if they save more, they can make more in the next year. It is a homophone with the idioms 年年有余 (nián nián yǒu yú) which is a wish for surpluses and bountiful harvests every year and 鱼跃龙门 (yú yuè lóng mén) implying successful passing a competitive examination.